Samode Palace is the sandstone built heritage monumental palace at the bottom of Aravali range. Like a fortress from outside, Samode palace is marvelous from its interiors as ancient architectral style were used inside its construction. Marble floors, ornamented pillars, stones engraved walls, luxurious carpets and old painting decor are making it more than a luxurious palace.Samode palace also has a Sheesh Mahal or Hall of Mirrors at its southern side. Durbar hall and in the Sultan Mahal frescoes are 250 years old. Samode palce is constructed on a three levels having a patio on each level. Now converted to a hotel, it is located at a distance of 40 km from Jaipur in village Samode. Samode Palce offers 43 spacious suites. Each room, with its own unique personality, is elegantly and luxuriously furnished. Four poster-beds draped with sheer, delicate fabric and exquisitely carved couches invite you to relax completely.Colour and spirit mingle with the sparkling of white linen and marble and with the warm wood of exquisite furniture. Samode is a world that effortlessly blends modern luxury with traditional opulence. By Road: Samode Palace is located at a distance of 40 km from the centre of Jaipur city in the north of Jaipur in Samode village. One can easily reach here with local taxi, roadways or private buses or cab. By Rail: Samode Palace, Jaipur is well connected through Jaipur Railway station to major cities railway stations like Delhi, Agra, Mumbai, Chennai, Bikaner, Jodhpur, Udaipur, Ahmedabad. 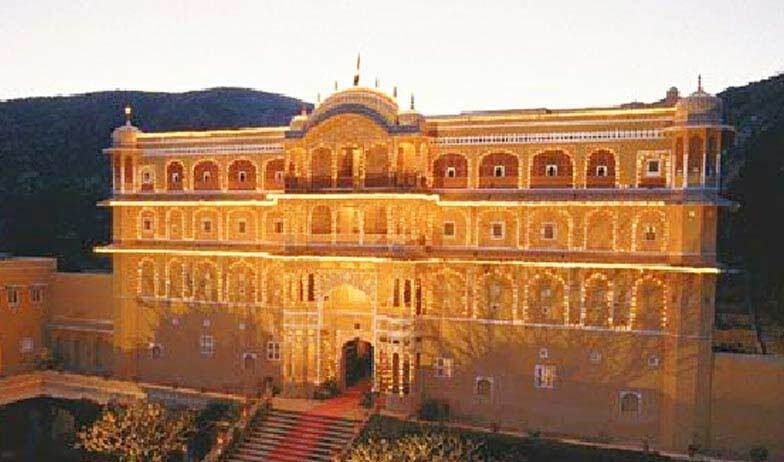 By Air: Samode Palace can be reach through Jaipur Airport, also called Sanganer Airport which is well connected with regular domestic flights to Delhi, Kolkata, Mumbai, Ahmedabad, Jodhpur and Udaipur.